Rarely do we come across a home that has perfectly Instagramable interiors like these! 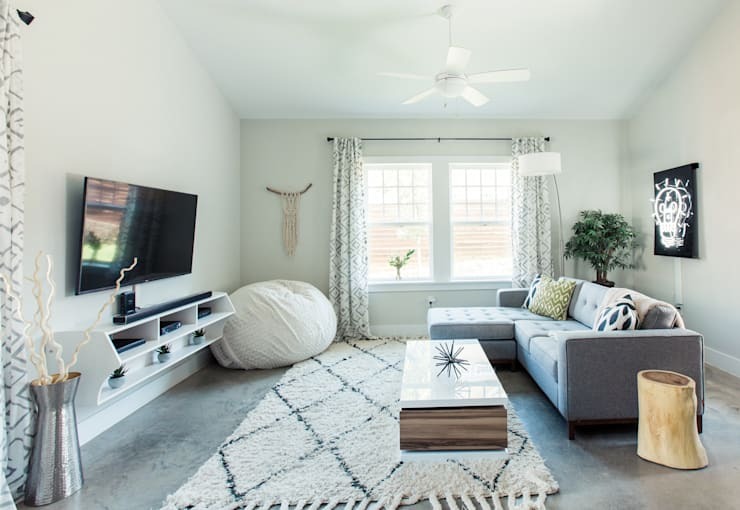 Today we’re checking out a project that blends boho-chic style with Scandinavian influence to create a gorgeous home. A simple black and white palette punctuated with rich pops of colour makes the home stand out. The modest interiors are amplified with white walls reflecting natural light. Let’s start our tour now and get ready to pin these pics to your home inspiration boards! Everything about this living room is modern and cool. 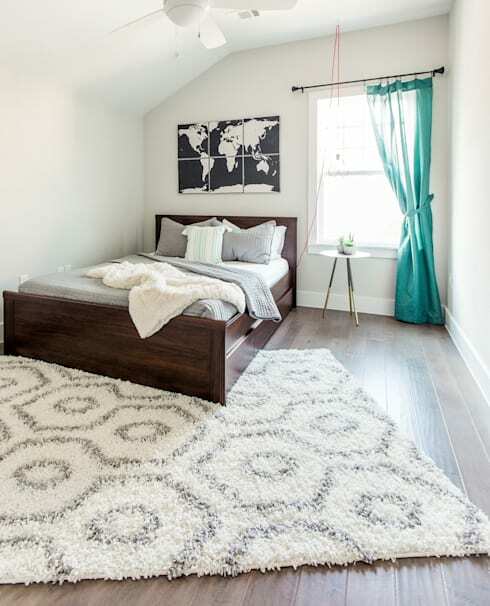 A puffy white rug with geometric shapes brings Scandinavian hyyge style to the room. The couch is kept clean and simple. A pouf in one corner brings whimsy and fun to the room. We love the neon light artwork on the wall. It gives off a Keith Harring vibe. A jewel toned ficus plant brings life to the room while the natural wood side table keeps the look grounded. This corner by the stairs encapsulates the simple palette at the heart of the home’s design. 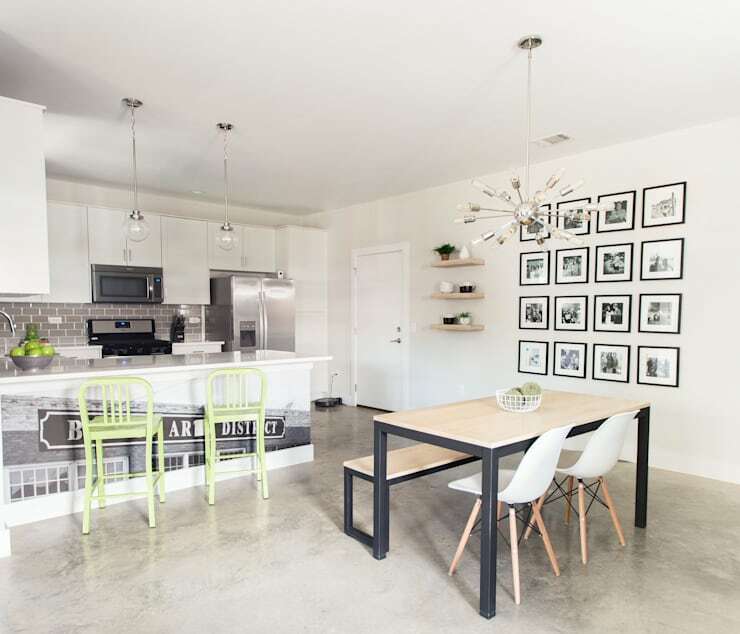 Concrete floors and white walls act as the backdrop for the decor. 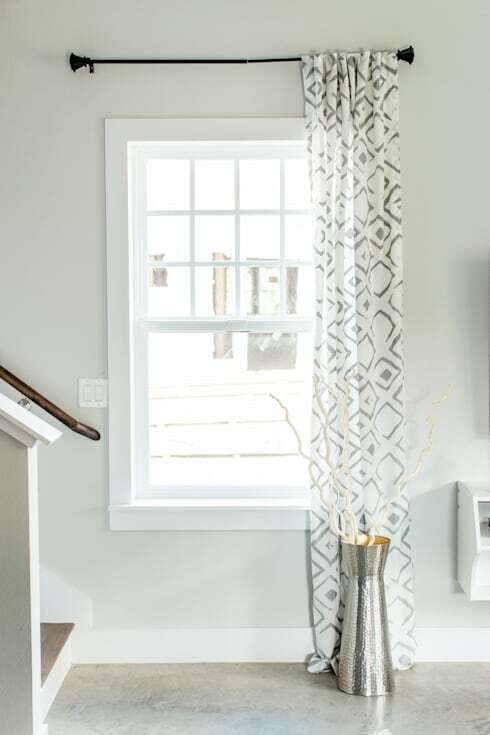 A thin and simple white curtain with geometric design keeps the home feeling bright and airy. The silver vase on the floor is a festive touch to the fun living room space! This bedroom on the top floor looks like a snug retreat. An accent wall features wood panels and brings a sense of authenticity to the space. We see reiterations of patterned textiles from the curtains and rug. Touches like these help bring cohesiveness to the home. We love the colourful touches from the armchair and headboard in this bedroom! This classy office is a chilled out space to work or relax. Wallpaper emulates a birch wood forest on one wall, bringing depth and style to the space. Minimalistic and purpose driven furnishings offer storage and work surfaces for two. Beneath the linen toned rug is a rich and sophisticated hardwood floor. 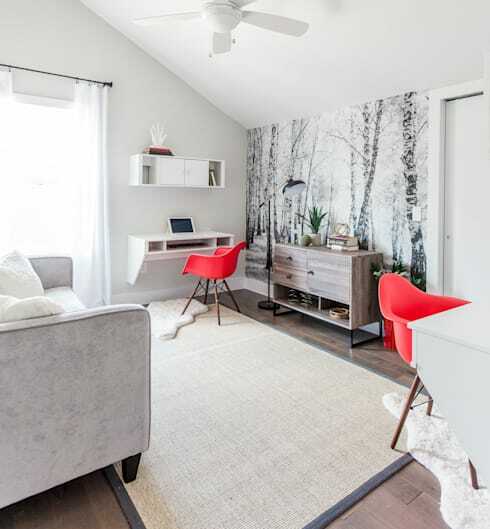 This looks like the perfect place to work at home in comfort and style! Though it may be small, this room packs a bold punch! An asymmetrical arrangement makes the space seem larger. A fresh pop of teal colour from the curtains makes the room feel more energized. At its core, the room is a simple and cozy. We love the refined bedlinens. They’re a welcome contrast to the bold shapes and colours in the room. Sometimes what makes a design wonderful is in the little things. The small details and decorative touches have a big effect on the overall outcome of the design. Here’s a closer look at some of the decor in the home that makes it so Instagram worthy. 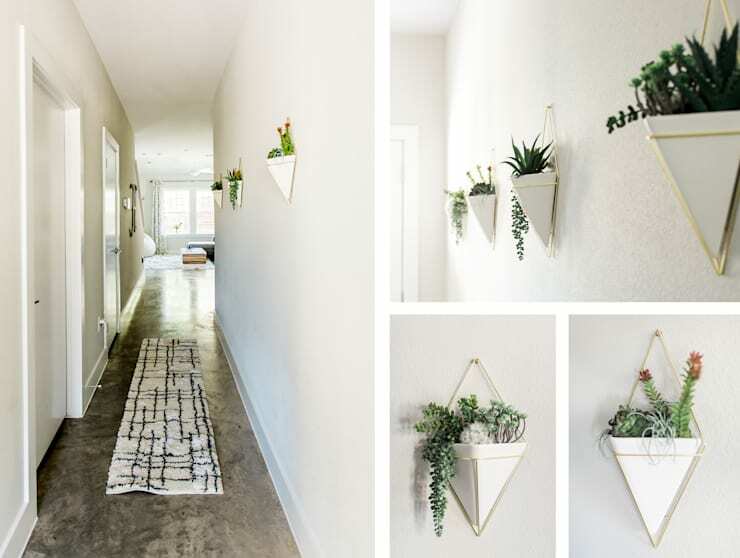 Triangle shaped succulent planters line the hallway. White ceramic with a touch of gold creates a subtle opulence that we love. 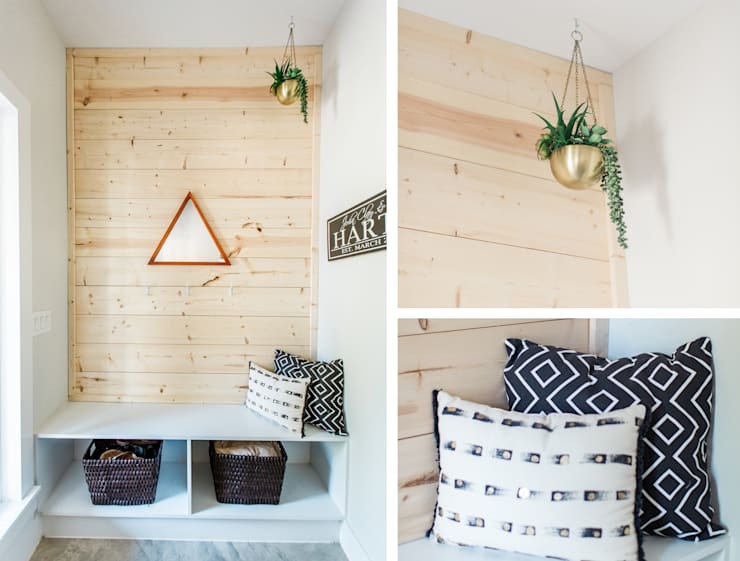 In this cozy corner of the home, there’s a simple bench with some storage underneath. A triangular shadow box on the wood paneled wall. Another gilded succulent planter hangs from the ceiling. Graphic printed Scandinavian cushions complete the look of this cozy spot. Want to get style like this in your home? 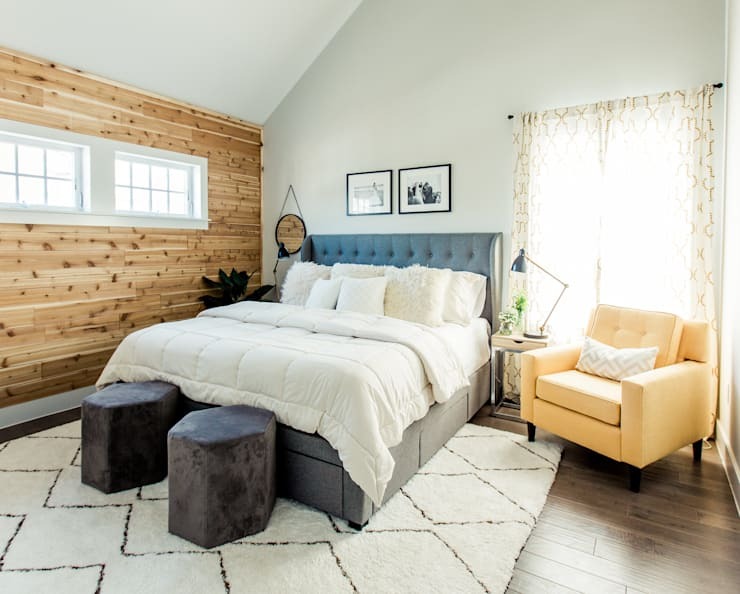 Connect with a professional on homify today. We’re wrapping up our tour with a look at the kitchen and dining space in the home. 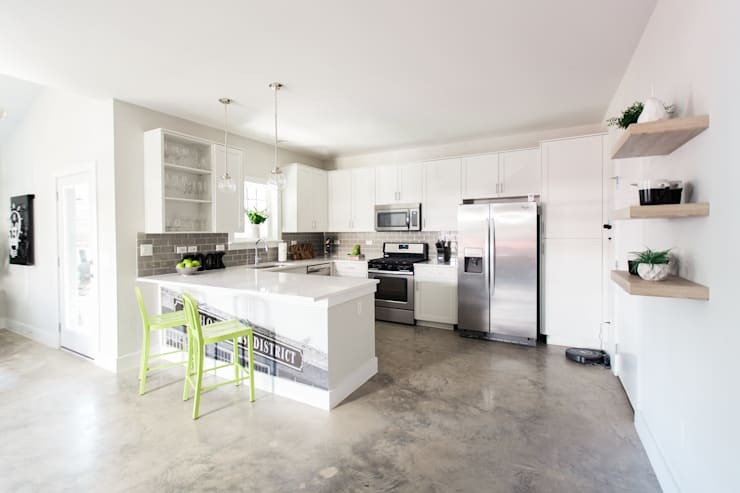 This kitchen grabs your attention with its urban style and clean design. We love the simple all-white cabinets and countertops. A wallpapered image on the front of the breakfast bar is a thoughtful touch. Stainless steel accessories are the perfect choice for this kitchen because they create a light industrial vibe. This is the kind of kitchen and dining space we’d expect to find on our Instagram feed! A crisp dining space looks like it was pulled straight from a chic downtown cafe. The gallery photo wall is great for bringing individuality and style to the room. The Edison bulb light fixtures over the breakfast bar and the dining table bring effortless ease to the style. With this view, we can fully appreciate the style and functionality of the space. Thanks for taking our tour of the perfectly Instagrammable urban retreat! Scandinavian and boho style make a great pair. For more home inspiration, check out our feature Hygge hype: A guide to Scandinavian style. Which filter do you love to use?